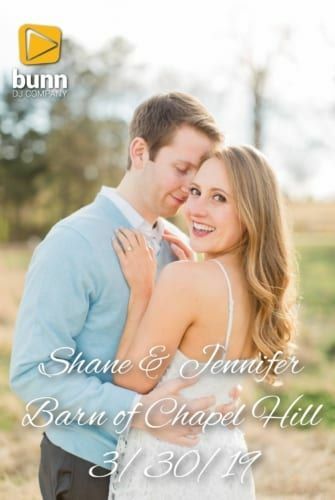 Jennifer and Shane had their ceremony and reception at the Barn of Chapel Hill. If you haven’t seen it, click the link and check it out. It’s gorgeous out there! I handled the ceremony portion of the day to start, then a bluegrass duo did the cocktail hour. The guests moved inside the barn for introductions around 6:30pm. I just intro’d the couple to “This Must Be An Everlasting Love” by Natalie Cole. They didn’t go into their first dance, instead opting to welcome everyone, and then have a blessing before dinner. My dude Beau from Beau Catering told everyone about the menu and the awesome dinner was served! After dinner, we picked it back up with toasts from the father of the bride and the maids of honor. Next, Jennifer and Shane went up to the loft area and cut their cake to Marvin Gaye’s “How Sweet It Is”. Next up were the formal dances. I had never done this order before, but it worked! The mother/son dance was first to “Love’s Divine” by Seal. Then Jennifer and her dad danced to “Just Fishin” by Trace Adkins. Finally, the first dance…they used “Grow Old” by Florida Georgia Line, and then next up, open dancing. From song one, that dance floor was on fire! Great crowd! The only time we paused was for the bouquet toss (“Single Ladies” by Beyonce) and then more partying until around 10:30 when we closed with “We Found Love” by Rihanna and sent everyone outside for the sparkler departure. Jennifer and Shane stayed inside for a while and did a private dance to “Millionaire” by Chris Stapleton…awesome song, awesome end to a great night. I can’t wait to see the photos from Krista with Six Foot Photography and the video from Shadowpoint Media. Also, shout out to Jessica with Happily Ever After for planning another perfect event.